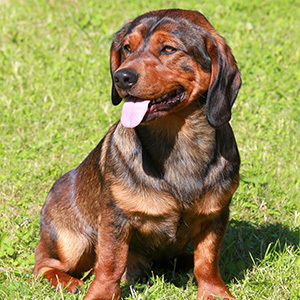 A scent hound with some impressive royal lineage. 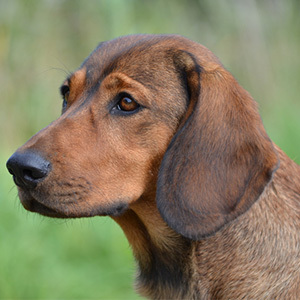 Originating from Austria, the Alpine Dachsbracke is a scent hound with some impressive royal lineage. As the story goes, in the late 1800’s Crown Prince Rudolf of Habsburg would take hunting trips to the Middle East. On these trips he required his gamekeepers to include a dog that was noted as being very similar to, if not the actual Alpine Dachsbracke. 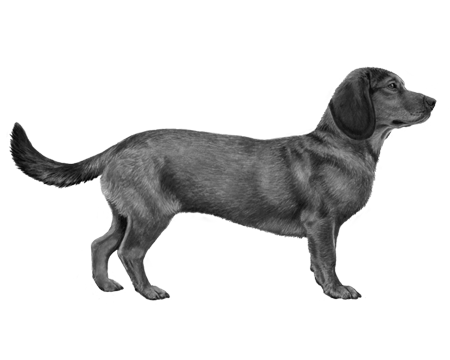 Descended from an ancient hunting breed, the Alpine Dachsbracke was originally bred for tracking wounded deer. 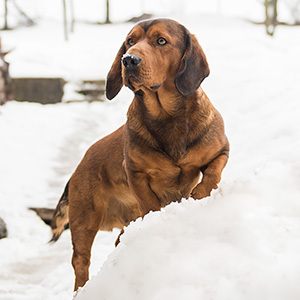 Their short stature and longer ears make them highly efficient at following a trail even when the scent has gone cold and as their name would suggest, they also do well in in high altitude. Considered medium in body size, they have a sturdy build with a dense coat and strong muscles. The ideal colour is considered to be a dark “deer” red with or without black interspersed in the coat. 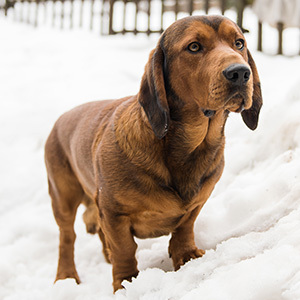 It is also considered acceptable to have an Alpine Dachsbracke with a black coat with clearly defined red-brown markings on the head, chest, legs, feet and the underside of the tail. While their fearlessness and intelligence make for a great working dog, it is their friendly nature that will win you over for a lifelong companion.